Our alarm woke us at stupid o’clock (4am) for the scheduled departure of 06:20. We had packed the night before, and once we woke the baby we put his monitor in our luggage and waited for the taxi at 04:50 to take us to the airport. The airport only opens at 05:00 in the morning, and given that it is only 10 minutes away (I’ve walked it several times before) we were not too worried when the taxi was a few minutes late. 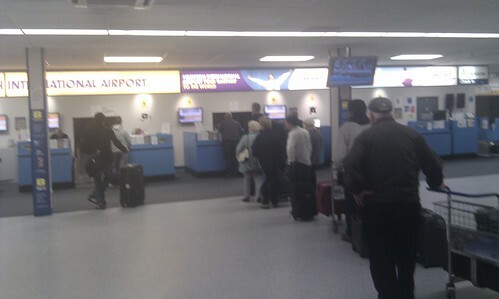 On arriving at the airport, we entered the small terminal building and joined the queue for check in. We had tried to check in online the night before, but it would not let us. It turns out that they had noticed we had the baby, and had moved us from our requested seats to the bulkhead seat on leg 2, giving us slightly more room. 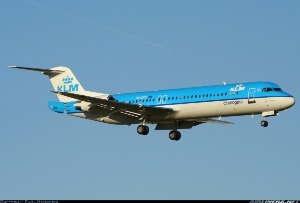 The flight passed quickly, as it usually does, and we landed smoothly on the Polderbaan and taxied to the apron, where the bus was waiting to take is to the main terminal. Load was around 60%. 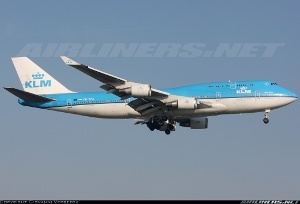 It appeared that the B747 Combi originally scheduled for this leg had been subbed for a full-pax model, perhaps how they had been able to allocate us bulkhead seats as there was an extra passenger cabin. Even then, the flight appeared to be completely full, at least in Y. Shortly after takeoff, my wife’s gluten free meal was served, and she ate it whilst I held Matthew (our baby). Then mine arrived, so we swapped over the child while I ate. Unfortunately I can’t remember what the meal consisted of. Matty had a short nap at one point, but to amuse him we had brough several toys and books for him to play with as well (nothing that made a noise though!) Fortunately for us, he is not yet walking at 17 months, he shuffles around on his bottom, so it is easier to make sure he doesn’t get into any mischief! Apparently I as a child was the same, not walking until nearly 2. Anyway, an ice cream was handed out mid-afternoon, and shortly before landing another light meal was presented, this time mine was a small pizza roll. Also at this point, an announcement was made that photography was strictly prohibited in Nairobi airport. This is a shame, as I was hoping for some interesting shots. As it was, it was dark by the time we landed anyway, and taxied to the terminal. On entering the terminal, we discovered that arriving passengers were not segregated from departing passengers, and we were already in the departures area. 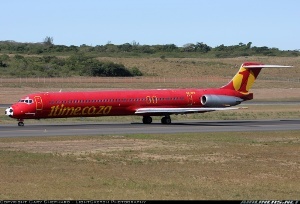 It just remained to find the gate for the Johannesburg flight. 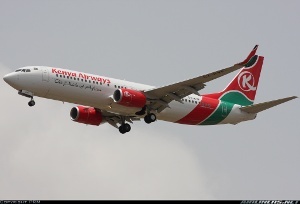 We followed signs for “KQ Transfers”, and asked where to go – we were directed back where we had come from, from a gate further round. It should be pointed out at this point that the terminal in Nairobi is semi-circular in shape, with one long corridor, and various shops on both sides. 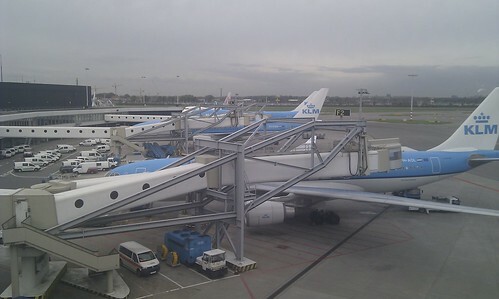 Periodically is a gate, with its own security station leading to a holding room behind the shops on the outside of the ring, and airbridges leading down to docked aircraft. Nowhere did I see an electronic departures board, once we found the gate for JNB there was a printed sign saying “Joburg” hanging above the desk. Our boarding passes were checked, and we proceeded through the security to the holding room. 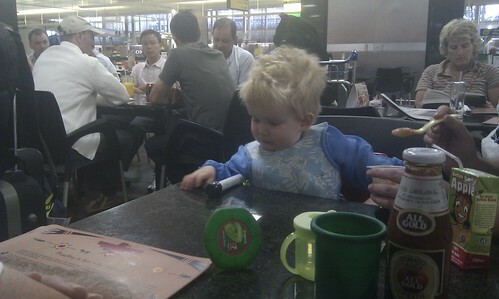 Once there, we fed Matthew his tea (jarred food for ease whilst travelling) and just a few minutes later we were called forward for pre-boarding, together with another South African lady with a baby travelling alone. She too had come from a regional UK airport, and chosen this route due to cost (like us, nearly £200 cheaper per person than the direct AMS-JNB flight, and only taking 2 extra hours). 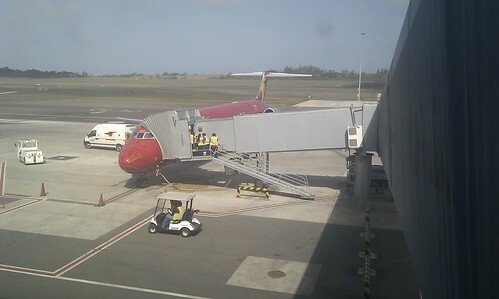 We walked down the jetbridge to the aircraft, which I noticed was a 767 – not the scheduled 737. But when we got to the door, the ground agent opened the door to the exterior and said we needed to go down to the apron. He offered to carry the puchchair we had Matty in. Once down on the concrete, another agent carried the other lady’s pushchair down, and we were led to the correct 737 2 stands away. At this point I would have loved to take photos, but alas it was not allowed. From here we left the folded pushchairs at the bottom of the aircraft steps, and boarded. 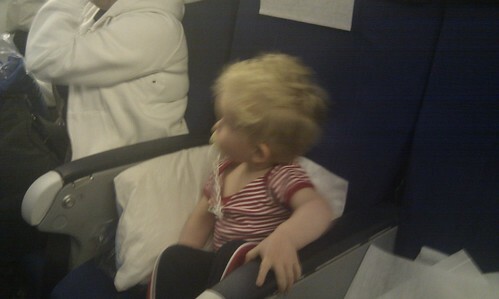 There was not a lot of room, and once everyone was on board (there were only one or two free seats) the guy sitting in the aisle seat (another South African coming from the UK via AMS) was asked if he minded moving – he readily complied, probably fearing screaming from the baby (of which there was not a peep!). For the most part, Matthew slept on Mummy’s lap, except during her meal, when he slept on mine. The gluten free meal on KQ deserves mention, as my wife says the hot, main meal was one of the best she has ever had on an aircraft, steak with potatoes and green beans, cooked to perfection, but the accompaniments were the worse – it was a standard meal tray, identical to the rest. It was just as well she didn’t eat the bread roll, as it was not a gluten-free one. This is a serious problem, and deserves KQ’s attention, due to the possible medical issues it could cause. My wife however was observant, and simply left the rest of the meal. 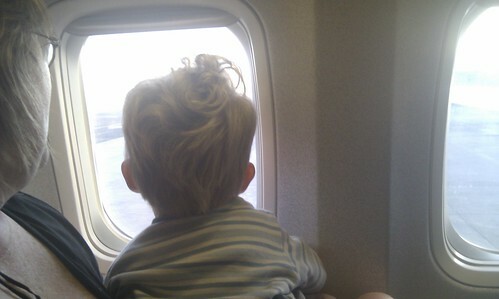 The rest of the flight continued uneventfully, for the 4 hours. The maps channel was showing on the overhead screens after the new Karate Kid film, but it took forever for the language to scroll through to one in the latin script – first Chinese, then Arabic, then what appeared to be Ethiopian before Swahili and English. 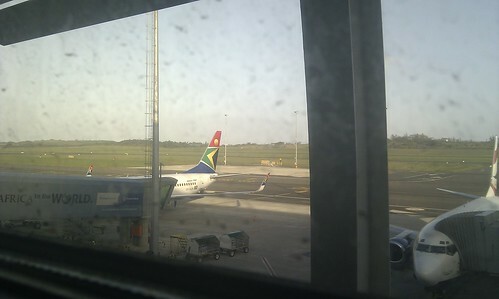 The flight landed at JNB, the last arrival of the night, ontime at around 23:30 and we picked up our luggage and headed to the car rental area. I had chosen Hertz, as they were the only company on their website that said they were open 24 hours, but on arriving, it seemed that every company’s office was still open at 1am! We picked up the car, a Honda Jazz (similar to what we own at home, but a newer model) and drove to my brother-in-law’s house in Centurion, to stay for a few days. After a pleasant few days in Gauteng, visiting family and friends of my wife’s, it was time to head to Durban to her parents. 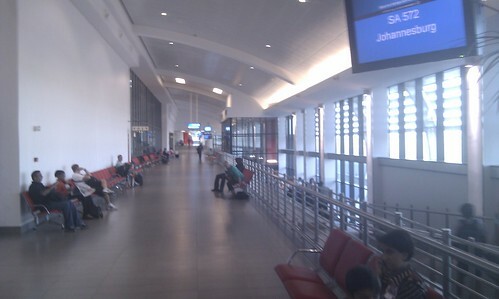 I believe this may be the first report covering the new King Shaka International Airport, recently opened in Durban. 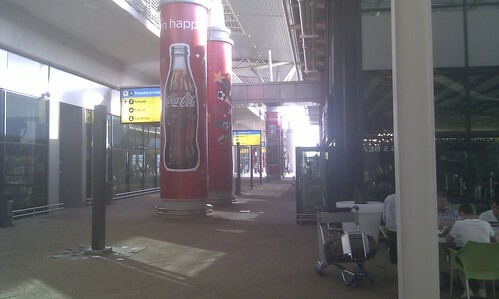 We arrived early at the airport, intending to meet one of my wife’s uncles for breakfast. 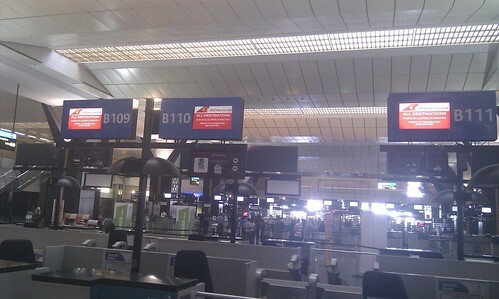 On getting to the checkin desk, though, we were turned away as they open flights strictly 2 hours before departure. Not a big deal, but we’d have to take our luggage to the restaurant level with us, and make sure we were back in time. We met the uncle for a late breakfast / early lunch in Spur (my wife’s favourite restaurant chain in South Africa) before going and checking in our luggage. Security was a breeze, and we found our gate for DUR. I thought I photographed our plane, but the entry points on the gates slope down very gently, so the plane I saw from the window was actually the gate next to ours – it left early, making me wonder if we would be late leaving as there appeared to be no aircraft at the gate. No fear though, it was there! 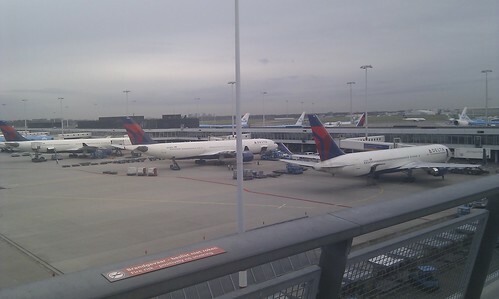 View from the window at the gate. Our aircraft’s tail is just visible on the left. 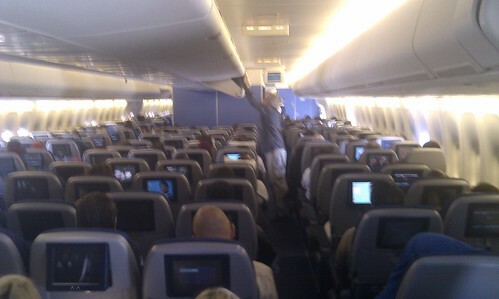 We boarded and took our seats on the left side of the plane, the 2 seat side of the aisle. Takeoff was powerful, and we were soon en route. 1Time offer children a small package, which was nice of them, even though Matty is too small to appreciate it! It consisted of a booklet of colouring pictures and puzzles, a pack of coloured pencils, a pack of Jelly Tots, and some temporary tattoos of wild animals. Once the service commenced, I pointed out that I had pre-paid for a food voucher – this was printed on my boarding pass, to the value of R25. We took two drinks and a pack of mixed nuts and raisins, but unfortunately the stewardess had to keep the boarding pass stub. 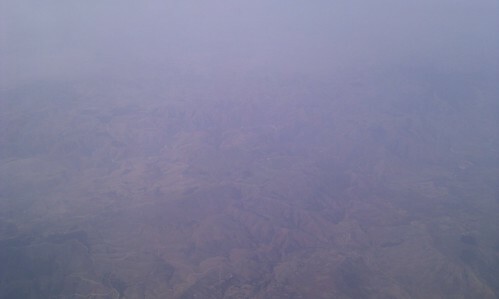 It was soon time to descent into DUR, and the landing was smooth. 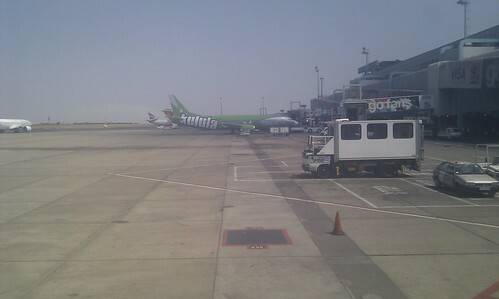 We docked at a jetbridge, and noticed next to us the Kulula aircraft that departed JNB 10 mins before us, also parked next to us. 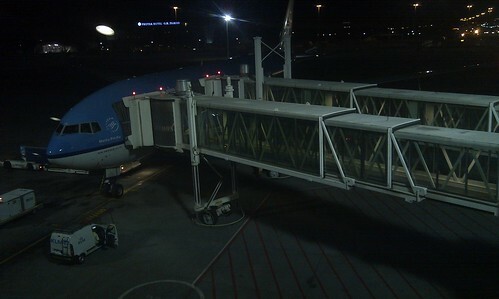 The jetbridge itself had glass walls, but a fabric sheeting had been fastened around all the visible jetbridges, with advertising on the outside, hampering views and photo opportunities. Once inside, we made our way down what seemed like a never ending passage to baggage reclaim, and went outside to meet my father-in-law, who was waiting for us. We then drove to their house, in Pinetown, a suburb of Durban. 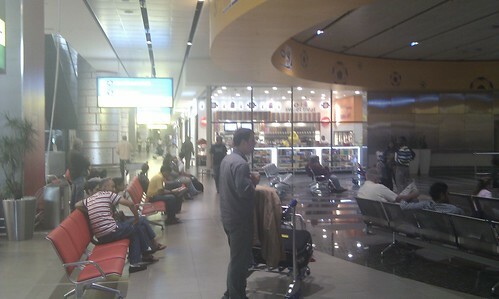 Overall, the airport looked nice, clean, modern, but rather generic, but I’d get to see more on departure. It should be noted that the SA Roads agency have installed a toll booth on the sliproad from the airport spur road to the motorway heading towards the city – clearly an attempt to moneygrab from arriving passengers. There is no toll airport bound from the city. We spent a pleasant couple of weeks with the in-laws, including a few days in the mountain resort town of Clarens, in the Free State, near the Golden Gate Highlands National Park. I also found out that I had very luckily won a competition! Courtesy of Air France, I had won flights, hotel and tickets for 2 to the Abu Dhabi Formula One Grand Prix! (check out the Air France UK Facebook page, and the update on 8th October – the original winner didn’t claim the prize, and I won the re-draw!) As I was due to be coming home from a couple of days in Prague on the day of departure, this meant that I needed to find another route home the day before, sacrificing the U2 ticket, and the absolute cheapest route home is by train to Berlin, and an FR ticket for EUR12 back to London from there. Anyway, we were in SA for the in-laws’ 40th wedding anniversary, and on the day after that it was finally time to leave to come home. 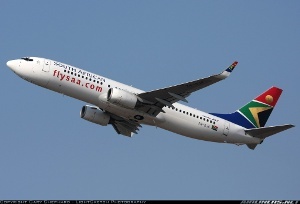 My wife’s uncle came with us to the airport, as he was booked on the SAA flight before us – it was R200 cheaper, when he booked it the week before. Never mind, we checked in, and were pleasantly surprised when the agent offered to check our bags all the way home to Norwich. She couldn’t give us our boarding passes for the later legs yet though. 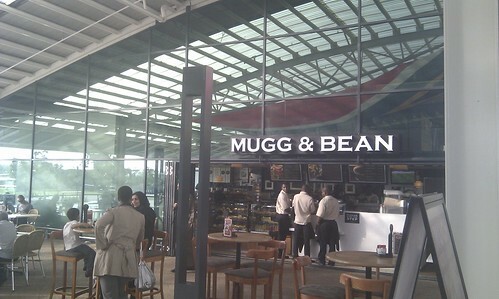 We then exited the terminal building on the arrivals level, as most of the refreshment options are in a separate building, and we could sit outside the Mugg and Bean coffee shop. The famous statue of King Shaka and the cows – which has had the King removed, leaving the statue of just cows. My wife persuaded her father to buy a ruby ring for her mother as a wedding anniversary present from the jeweller’s shop, and we had a quick drink, before we went through security. 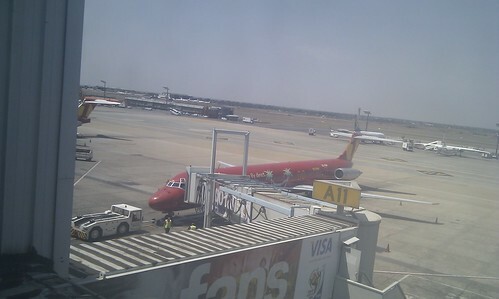 By this time, boarding was about to begin, and the gate was directly in front of the security checkpoint, so we didn’t really have long to explore airside, but I took a picture of our plane before we started boarding. There was no pre-boarding announcement for passengers with children, elderly, or elite members. 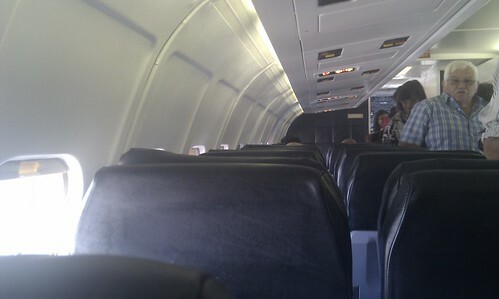 We boarded and moved down the plane. Load here was around 80%, and again the lady next to us on the aisle offered to move if possible – the stewardess agreed, she could move after takeoff. There was also an announcement that phones with a flight mode, such as mine HTC, were not allowed to be used at all, like regular phones. Shame as this was what I had been taking photos with. 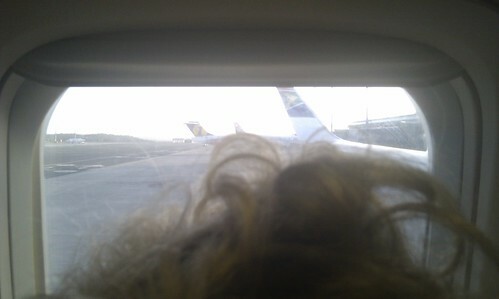 There was a long taxi the length of the runway, and we took off. The announcement was made that as the new airport is so much closer to JNB than the old one, there would be one less drinks run, so we should order all drinks first time. We were then handed a small sandwich (pastrami or cheese) with a pecan pie. 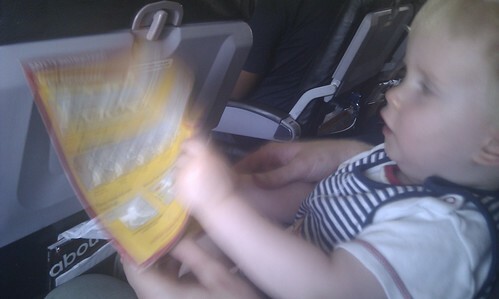 My wife had rice crackers with smoked salmon, and Matthew was given an infant meal consisting of a jar of baby food and a carton of apple juice. 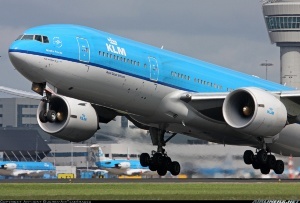 The rest of the flight was uneventful, except for the landing – bang, what a hard landing! It looked from just before that we were descending a bit fast, and my wife swears we bounced (I hope the undercarriage was ok), but apart from the jolt all was well. 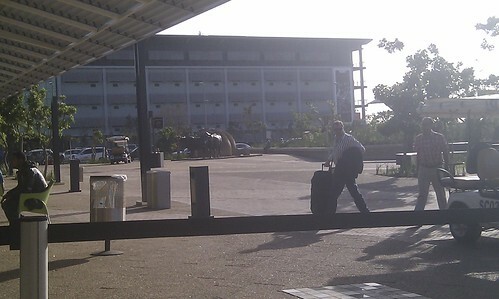 We exited, picked up the pushchair from the luggage enquiries office, and went outside to find my wife’s uncle. He was waiting for us, so we made our way over to international checkin to obtain our boarding passes, which we did, and then back to Spur, for a final meal with the uncle and brother-in-law and his family. By this time Matty was exhausted, so I walked him up and down a few times until he fell asleep. 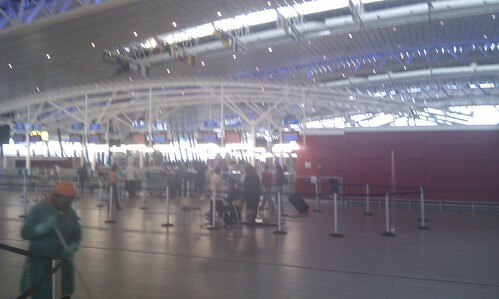 We had a nice meal, said our goodbyes, and went through security (the secondary once near the Gautrain station). I bought some duty free cigarettes for a colleague who’s asked for some, and my wife bought a couple of books and a bottle of water, before we headed to the gate. There were a couple of agents there checking passports, to make sure everyone had the right visa (or passport) to be allowed to enter Europe. Not a problem for us as I’m British and my wife and baby are both dual nationals, South African and British. We entered the holding area, and proceeded to the front area near the desks. Some time later, someone came and started cordoning off the front area, leaving us inside this area. There were some other priority boarders, also in the cordoned off area. Eventually boarding was called, and we were one of the first, even though there was no official pre-boarding. Once again, we had been assigned the bulkhead seats, in the rear cabin. There was another lady in the 3rd seat, who spoke very little English, or any other language that my wife or I could understand (Afrikaans, French, German). Turns out she was Czech. Boarding went as well as could be expected, and we took off on time, just before midnight. Once again, load was almost full, but there was at least one spare seat, as the Czech lady was asked if she wouldn’t mind moving, which she gladly did. Once airborne, we tried to get Matthew to sleep on my wife’s lap, but he was not interested – he is fascinated by everything, and wants to watch everything, even when he is exhausted! 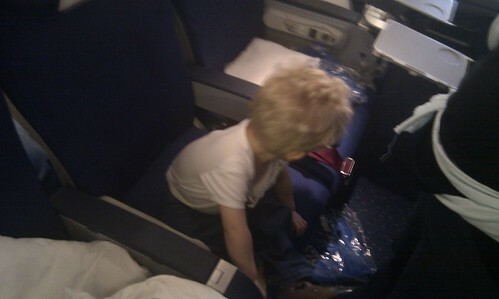 The steward said it would be ok to lay him on the floor (as long as we picked him up in case of turbulence) which we did. He was laid into a kind of nest made from pillows and blankets, and eventually fell asleep. My wife and I also dozed, but found it difficult to sleep properly in case either Matthew had woken up and wandered off, or we accidently kicked him whilst asleep. Meantime, my wife’s GF meal had arrived. It was a snack box with rice crackers and a fruit salad, along with a “hot snack” which was a piece of fish, with rice and a tomato sauce. My wife wasn’t hungry by this time (about 2am) so I ate her hot meal, before my own, which was a chicken curry. Neither was very large. We kept the rest of her food for later, which Matthew ended up eating the fruit salad himself. On waking, we fed Matthew his breakfast of cornflakes, and the fruit salad mentioned. Our own breakfasts arrived, almost identical omelettes with potatoes and mushrooms (except mine contained a sausage as well). We landed, smoothly this time, and taxied in to the gate. We waited until everyone else had left before gathering all our things, and leaving. AMS has signs partway along the jetbridge pointing our where to pick up and leave pushchairs, so we waited there. Nothing seemed to be happening, until one of the stewards asked if we were ok. We explained that we were waiting for the puchchair, and he went off to find out if it was coming. In the meantime, a ground agent came and gave us the pushchair, so we could sit Matthew down in it, as he is getting rather heavy to carry! We thanked the flight attendants, and continued into the terminal. We first wanted to go to the AMS baby care room, so Matthew could have a sleep, but it was full. All 7 cubicles had sleeping children with restless parents in them, so we left with other thoughts. We decided to head landside to get some food, and bought some overpriced ham and cheese in the supermarket next to the aviation hobby shop, and some chips and salad from Burger King. After eating, and feeding Matthew his lunch, we went up to the panorama terrace. Great views, despite the biting wind. I would certainly like to return in warmer weather! 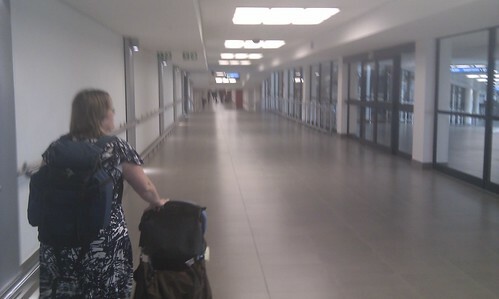 We then headed back to the airside baby lounge, which was by now almost empty, and put Matthew down for a sleep, whilst my wife and I both dozed. It was soon time to head to our gate for the last leg of the trip, the hop over the North Sea to Norwich. These flights are usually from the non-Schengen bus gates at D6, along with most other UK regional departures. We passed the security and waited to board the bus. Pre-boarding consisted of us and two other couples with babies, we started chatting with one couple, a British girl with her Japanese husband, and their baby, making their first trip back to her parents for some years, indeed it was her husband’s first ever trip abroad. Then the agent came onto the bus to explain that the aircraft had a problem – they needed to change a tyre, so we would have to return inside whilst they did this. It would take about ½ an hour, which it did. Eventually we could all reboard the bus. 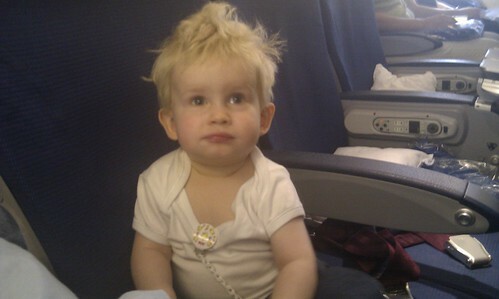 The problem with bus boarding is that those of us with babies, whilst 1st on the bus, still we not first on board the aircraft, but the ground crew still tried to hold back every one else so we would have a chance to get Matthew settled. 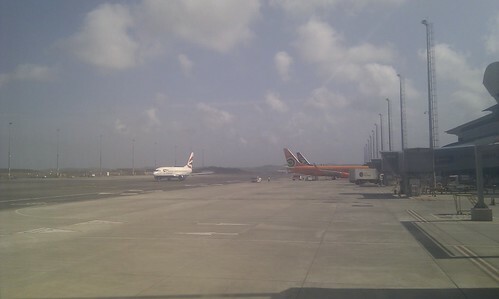 On board, we departed, using one of the close in runways this time, for the short flight. Service consisted of a cup of juice and a biscuit (similar to British Hob Nobs), which I ate whilst we fed Matthew a yoghurt. It was very windy on approach, but despite our fears landing was very smooth, but due to the short runway we had to brake heavily. We were last off the plane, and with a light drizzle to welcome us back to England, we ran to the terminal to pass passport control and collect our bags. We exited the terminal, and took the only taxi waiting, and we were home 10 minutes later.